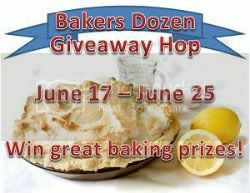 Come join a fun group of bloggers for the Bakers Dozen Giveaway Hop! From June 17th through the 25th a great team of bloggers including myself will be giving away some super fun baking prizes from some generous sponsors! Requirements: Each blogger will have to provide or find a sponsor to provide a $25 prize or more, if you have over $100, The Flower Hazard (host) will do a special giveaway hop post featuring your prize. To Join: Fill out you information in the form, add your blog to the linky and post the information about the upcoming giveaway and blogger opportunity on your blog! In order for this event to work the best everyone needs to share this event so we can get the maximum exposure and sign ups so please SHARE and share. Post: It's a perfect time to find your inner baker! With new technology comes greater baked goods, but some items have stood the test of time! The Flower Hazard is proud to present the Baker’s Dozen Giveaway Event from June 17 12:01 PM EST to June 25 at midnight EST and is accepting signups now!